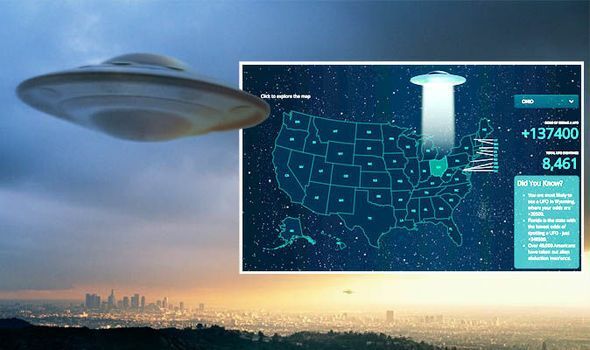 Home » UFO sightings in the USA MAPPED: Where are you most likely to see alien craft in the US? UFO sightings across the US have become an almost daily occurrence since the 1940s, but certain states seem to be more welcoming to extraterrestrial visitors than others. Here is a map of the most likely place in the USA to see UFOs. Researchers at Casino.org trawled back through decades worth of UFO sightings to narrow down the highest concentrations of alien encounters in the US. The team behind the ambitious study have now shared their data with Express.co.uk alongside a map of the 50 US states. Editor David Sheldon, exclusively told Express.co.uk the US is one of the world’s leading hotspots for UFO sightings. He said: “While many of us are quick to dismiss UFOs as being the stuff of science fiction, there have actually been over 250,000 recorded sightings of UFOs in the USA alone. “In addition, over 40,000 Americans are concerned enough about extra-terrestrial life forms to have taken out alien abduction insurance. “And the US government takes them seriously enough to have set up The Advanced Aviation Threat Identification Program, elements of which are still classified. You can explore Casino’s interactive UFO sighting map by clicking here. According to Casino’s research, you are most likely to stumble upon extraterrestrial phenomena in the states of Wyoming and Vermont. Over the past 78 years, more than 2,854 and 2,493 sightings were reported in the two states respectively, giving them both odds of 250/1. Montana with its population of over one million people, came in close third with 4,179 sightings and population-based odds of 252/1. The other states to fill out the top 10 list are North Dakota, Alaska, Hawaii, New Mexico, Rhode Island, New Hampshire and Maine. In the state of Maine, which boasted a population of 1.3 million people in 2017, just over 3,600 sightings were reported since the last century. In total, Americans have claimed 259,691 UFO sightings over the years. According to Casino, the fear of alien invasion has prompted more than 40,000 Americans to take out life insurance against UFO abductions. In Texas alone, the number of alien sightings is double the population of the island of St Helena – which is interesting because Texas features second on the list of top 10 least likely states to encounter a UFO. The top spot was taken by the 20.9 million-strong Florida, where only 6,020 people claimed to have seen ETs – giving odds of 3,485/1. New York and Illinois came in close by with odds of 2,584/1 and 2,242/1 respectively. The rest of the least likely states to see an alien are Pennsylvania, Tennessee, Arizona, New Jersey, Michigan and Maryland.